Sometimes it’s possible to trace the source of a lifelong affection to a single defining moment. For me, it’s typography and On Beyond Zebra! Dr. Seuss was a grand influence on my life. I discovered I knew how to read — hooking up words with the shapes of letters — entertaining my younger brother by reciting the memorized verses while showing him the pages of One Fish, Two Fish, Red Fish, Blue Fish and The Cat in The Hat. Since that moment, my enjoyment of reading and the configurations of letters has been intrinsically linked. The achievement of On Beyond Zebra! is the suggestion that I could make up my own letters, and therefore express something that was uniquely me. Something necessary, and before that, impossible. And to do so… beautifully. With letters! Who never comes down ‘til it’s time to refill. It was this exhortation, to explore and discover, combined with the reminder that I did not, in fact, know all there is to be known, that keeps me curious and eager to learn new stuff. And to draw alphabets, and study all the ways they have ever been drawn. Different shapes have different meanings, and in typography they are subtle and profound. Words are power. Dr. Seuss knew children can understand this. i want to know more.. what comes after z? 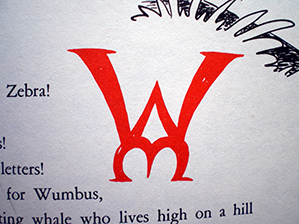 According to Dr. Seuss, it’s WUM (for Wumbus). I heartily suggest you read the book. No it is JOGG for Jogg-oons! 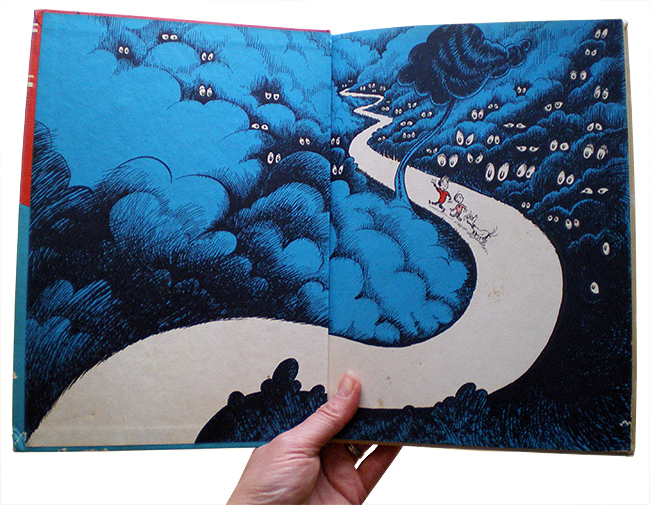 Tomorrow (March 2) is Theodore Geisel’s birthday. He, along with A.A. Milne are my favourite poets. I’m not sure if that is an admirable childlike quality of mine or just basic immaturity. Incidentally, that day is also the anniversary of the creation of a certain, haiku-based organization in a stick figure game of ill-repute led by a disreputable hippopotamus. And their grandmothers’ grandfathers’ step-sisters’ wigs.